Every fifth person in the world is a Muslim? Majority of the Muslims are of non-Arab race and nationalities? There are 8 million Muslims in the U.S.A.? Islam is the fastest growing religion in the U.S.A.? Isn't it time to familiarize yourself with Islam? The centuries old Shia Sunni differences are the major obstacle to Muslim unity (Shia Sunni unity). The enemies of Islam to their benefit have always fanned these differences. Unfortunately, some so-called Muslim scholars on their payroll have also played a key role in keeping these differences alive. Although I was born into a Sayyid Sunni family, I did not know of many differences while growing up as a child. Our families always respected Imam Hussain (peace be upon him) and his parents and participated in ceremonies marking the anniversary of his martyrdom (the 10th day of the month of Muharram which is called Ashura) by reciting the first chapter of the Holy Qur'an (al-Fatihah) and other chapters and verses of the Holy Quran and fasted on the ninth and tenth days of that month. Now when I give lectures on Islam to non-Muslims, one of the questions they always ask me is if I am Shia or Sunni. I ask them if they know the difference. They have no knowledge, other than what has been given to them by the media. So they say Shias are the ones who are the bad guys, the militant version of Islam, and cause all the trouble in the Middle East these days. These non-Muslim American audiences of mine are surprised to learn that some of the known tyrants like Saddam Hussain and troublemakers like the PLO and Hamas are all Sunni's, just as they are surprised to learn that Tariq Aziz (Former Iraq's Foreign Minister) was Christian and not a Muslim. This is what I say to them about Shiite. "If Ali ibn Abu Talib (cousin of Prophet Muhammad (pbuh)) was a Shia, then I am a Shia. If he was a Sunni, then I am a Sunni [i.e., a follower of Prophet Muhammad (pbuh)]." In Islam there are five recognized schools of Divine Law: 1) Hanafi; 2) Shafi; 3) Maliki; 4) Hambali and 5) Jafari. The first four are called Sunni, and the fifth one, who in addition to following sayings and actions of Prophet Muhammad (pbuh), also follows those of Ali ibn Abu Talib and consider him as the rightful successor of the Prophet Muhammad (pbuh), are called Shia. The first four have many major theological differences among themselves and according to a Christian friend of mine, "The only time Sunni's are united is when they are fighting Shias." Shiism started as a political movement (Shia means follower or partisan) to help Ali ibn Abu Talib become successor of Prophet Muhammad (pbuh). Around every successful popular figure, there are some admirers whose own future interests rest with the rise of their leader. Thus in Indiana, we have "Friends of Lugar Club", who are hoping that some day Senator Richard Lugar will become a US President. Nationally, we now have a "Hillary Rodham Clinton Fan Club" with 4,000 members! Thus, there were the Followers of Ali ibn Abu Talib Club, which later on became a political movement. During the initial battles with unbelievers, Ali ibn Abu Talib, the Sword of Islam, was in the forefront and defeated and killed many of their leaders whose children and grandchildren, even when they became Muslims, always remembered who killed their father (animosity). Ali ibn Abu Talib was raised by Prophet Muhammad (pbuh) as a child so he knew Islam very well. Thus, when Ali ibn Abu Talib became a judge, his judgments were based on strict Islamic principles, much to the disappointment of many who expected him to be lenient to the rich and powerful. Ali ibn Abu Talib was so well respected and trusted by both Caliph Abu Bakr and Umar, that in difficult cases they asked his opinion. Nevertheless, I tell my non-Muslim audience that both Shia and Sunni have many things in common. They both believe in One God (Allah), follow the same Prophet Muhammad (pbuh) as the last Prophet, offer five daily prescribed prayers, perform the prescribed fast in the month of Ramadan, go to Makkah for the Hajj pilgrimage, read the same book of Allah, Holy Qur'an, and pay the poor-due (Zakat). However, my answers can only satisfy my uninformed non-Muslim audience. The Sunni brothers, misguided by western propaganda, who are ready to embrace non-Muslims (especially the white ones), in the pretext of invitation to Islam, will not do so for Shia. They are ignorant Sunni's. Our job as a missionary should be to invite both groups to the true Islam and not chase them out. There is a movement in the Sunni world to have Shias labeled as disbelievers. I have been told that Shaykh Bin Baz of Saudi Arabia has declared an edict that the meat of the People of Book (Jews and Christians) is permissible for Sunni Muslims to eat but not the meat slaughtered by Shias. There are scholars on both sides, like Imam Khomeini and Shaykh Shaltut of al-Azhar who have done their best to minimize these differences and bring unity, but it is not working due to the misinformation prevailing in the common masses of Sunnis about Shiism. Thus I am listing their misconceptions of Shia belief and practices. For answers, I have consulted two Shia scholars in America. Dr. A. S. Hashim of Washington and Imam Muhammad Ali Elahi of Detroit. Professor Seyyed Hossein Nasr wrote to me "to ignore and not waste time in responding to such wrong allegations." He also mentioned that "a great deal of money and effort is being spent in the last few years to fan the fire of hatred between Shia and Sunni in the Persian Gulf region with obvious political and economical fruits for powers to-be." However, in the interest of Islamic unity, I must deal with the questions rather than shun them. Please note that Imam Jafar as Sadiq (peace be upon him), founder of the Shia school of law, was the teacher of Imam Abu-Hanifa (peace be upon him). Misconception #1: Shias have a different Holy Qur'an. They add another 10 chapters to the original Holy Qur'an. Response: Not true. 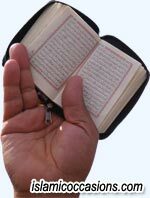 I have checked many times Holy Qur'an kept in Shia homes and mosques. I still find it the same as the original Holy Qur'an. More recently, I took care of an Iranian lady patient hospitalized here. I saw a copy of the Holy Qur'an by her side. I borrowed it from her and browsed through cover-to-cover. In Arabic it was the same as our Holy Qur'an. Of course, since I did not know the Persian language, I can't say much about the translation. It is a sin to even say that the Holy Qur'an can be changed or added to by Shia when Almighty God protects it. Misconception #2: Some Shia considers Ali ibn Abu Talib as God. Response: Not true. It is disbelief to even think of such a thing. During the time of Ali ibn Abu Talib, some pagan groups called Gholat did consider Ali ibn Abu Talib as Lord. When he found out, they were burned to death. Misconception #3: Shias have different declarations of faith and they add to the call to prescribed prayer. Response: The declaration to become a Muslim, as administered to non-Muslims, is the same. Some Shia add to themselves, "Ali ibn Abu Talib is a friend of God or Ali ibn Abu Talib is a spiritual leader of God," after the call to prescribed prayer, but not as part of the call to prescribed prayer. Misconception #4: Shias do not perform Sunnah prayers. Sunnah prayers are non-obligatory prayers performed by Prophet Muhammad (pbuh). Response: Shias do perform non-obligatory prayers, 36 cycles per day in total, but call it Nawafil and not Sunnah. Misconception #5: Some Shia believes the Angel Gabriel made a mistake and prophet hood was meant for Ali ibn Abu Talib and not Prophet Muhammad (pbuh). Response: Not true. No Shia thinks of such false claims. "Only demented minds think of such questions." Misconception #6: Shias slander and ridicule the first three caliphs (Abu Bakr, Umar and Uthman) and Prophet Muhammad's wife, Ayesha. Misconception # 7: Shias combine all five prayers into one prayer in the evening. Response: Not true. In Shia mosques, whether in Iran or the USA, all five daily prayers are performed. Shia do combine noon and afternoon and evening and night, but Shia scholars recommend performing them separately. Such combinations may not be ideal, but better than not praying at all. How can a Sunni who does not pray at all be better than a Shia who combines prayers? Misconception # 8: Shias do not pay zakat (poor-due). Response: Not true. They not only pay 2.5% left over from savings as zakat, but also an additional 20% as Khums or general charity. However, they prefer to pay directly to the needy rather than corrupt Sunni government. Misconception #9: Shias practice temporary marriages (Mutah). Response: Temporary marriages (Mutah) was allowed during the time of Prophet Muhammad (pbuh) and he himself practiced it. Ibn Zubayr was born out of the temporary marriage. Later on Caliph Umar prohibited it due to social reasons as the Islamic world was rapidly expanding. Shias discourage Mutah but do not consider it prohibited. Some do abuse this. As a temporary privilege during travel, it is better than adultery. Misconception #10: They consider Imams infallible and above the Prophets. Response: Not true. All prophets are born Prophet but as mentioned in the Holy Qur'an about Abraham that after passing the test, a prophet becomes a leader (Imam). Prophet Muhammad (pbuh) is the Prophet (Nabi), Messenger (Rasul) and leader (Imam). Imams are carriers of the message of Islam. Shias consider Ali ibn Abu Talib only as an Imam and not prophet. With the little knowledge I have, I tried to do my best as a Sunni in defending my Shia brothers in Islam with the hope and prayer to God Almighty that He will "instill love in the heart of the believers" and bring us closer to each other so that we jointly can fight our common enemy, Satan and his followers. May God forgive my mistakes in this article and this book (Amin). "Knowledge is better than wealth because it protects you while you have to guard wealth. It decreases if you keep on spending it but the more you make use of knowledge, the more it increases. What you get through wealth disappears as soon as wealth disappears but what you achieve through knowledge will remain even after you." Dr. Shahid Athar M.D. is Clinical Associate Professor of Internal Medicine and Endocrinology, Indiana University School of Medicine Indianapolis, Indiana, and a writer on Islam. I swear by the time, Most surely man is in loss, Except those who believe and do good, and enjoin on each other truth, and enjoin on each other patience.